The other day I mentioned in the comments of another blog that I did not attend a recent media tasting at Widmer. Not invited. The fact is, this blog hasn't been around that long and I'm not as well connected as I would like to be. I'm working on fixing that, but it takes time. There was a fair amount of commentary around the blogs about Widmer's new beers...Dark Saison and Spiced IPA. I made a trip down to the Gasthaus last night to check out the new beers. The Dark Saison has been on tap at my athletic club for several weeks so I'd already tasted it. The IPA just became available. As noted, the Dark Saison is on tap at my club. Yep. We drink a bit of beer after racquetball and have been doing so for years. This is at Lloyd Athletic Club next to Lloyd Center. It's a sort of private tavern for some members. And the club has a longstanding connection to Widmer, so I guess we get some beers before they are in common release. Anyway, Dark Saison is brewed in the classic French farmhouse style, with about 10 percent wheat and some dark malts that provide color, but not much backbone. They use Wyeast Saison yeast. The beer has a citrus character on the pallet, thanks to the Saaz hops. I liked this beer when I first tried it several weeks ago and I had the same reaction last night. Good stuff. 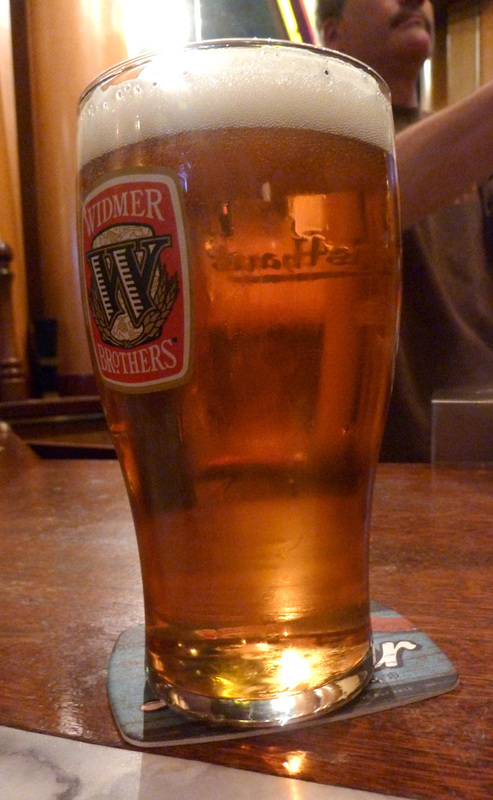 Spiced IPA is the fourth entry in Widmer's Rotator IPA series. Just to jog everyone's memory, the order goes like this: X-114 IPA, Falconer IPA, O'Ryely IPA (made with rye) and now Spiced IPA.The Rotator IPA series is intended to give Widmer brewers a chance to experiment within the style. It's a great idea. Spiced IPA is made by blending in black tea and unspecified spices after fermentation. It comes across as a bright and marginally spicy beer. The specs say 70 IBUs, but hop aroma, flavor and bitterness seem slightly subdued. When I was putting together the entry on Widmer Brothers Brewing for my eBook last summer, I concluded they were producing a lot of good beers, but perhaps falling behind some of the smaller breweries in terms of experimentation. That section will now need to be rewritten. The tap list when I visited the Gasthaus back in July was comprised of eight beers, plus a couple of seasonal selections. Last night's list had 14 beers, including some you won't see around town. The beer list and the newly released beers suggest that Widmer is back in the groove, continuing to produce the great beers they're known for while pursuing experimental projects that will lead to bigger and better things. Nice. I'll take it out.